Humpback Dolphins (Sousa spp. 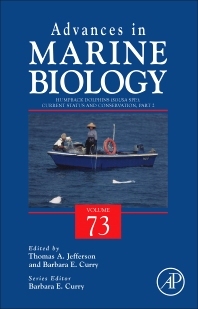 ): Current Status and Conservation, Part 2 is part of Advances in Marine Biology, a series that has been providing in-depth and up-to-date reviews on all aspects of marine biology since 1963 — more than 50 years of outstanding coverage from a reference that is well known for its contents and editing. This latest addition to the series includes updates on many topics that will appeal to postgraduates and researchers in marine biology, fisheries science, ecology, zoology, and biological oceanography. Specialty areas for the series include marine science, both applied and basic, a wide range of topical areas from all corners of marine ecology, oceanography, fisheries management, and molecular biology, and the full range of geographic areas from polar seas to tropical coral reefs.